VFL: Round 9 win in 60 seconds Get a snapshot of Collingwood's 42-point win over Werribee in 60 seconds with Collingwood Media. Rookie forward Brenden Abbott kicked a career-high six goals, including four straight Collingwood's dominant third quarter. Photo: Shane Barrie. It started with a passionate half time message from coach Dale Tapping and finished with an regulation opposition behind. However its what happened in between these moments in the third quarter of Collingwood’s round nine VFL clash with Werribee which will be remembered for a long time to come. Collingwood kicked ten straight goals, turning a 20-point deficit into a 41-point lead. 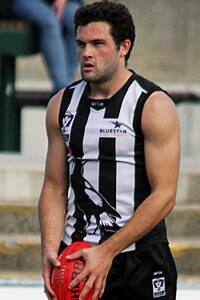 The Magpies had 19 inside 50s to Werribee’s three, 14 clearances to five and 30 marks to 22. After a quiet start to the day, the returning Levi Greenwood collected 18 disposals in the quarter, while rookie-listed Brenden Abbott kicked four straight goals in 30 minutes of football before finishing the game with a total of six. “The second half the boys came out firing and it was pretty easy as a forward just to lead up when the boys are doing their job,” Abbott told Collingwood Media post match. VFL RECAP: Relive the match with Collingwood Media's play-by-play coverage. “I think we worked as one. We had a lot more space around the ball and that was pretty evident in the entries we got,” he said. Tapping threw a surprise in the mix pre-match, sending 19-year-old Darcy Moore to full forward to cover for the absent Michael Still. While limited of opportunities, Moore competed well before being rested in the final quarter. After a disappointing second quarter in which Collingwood surrendered the lead, Lockyer believes the players followed directions to respond well in the third term. “We just needed to clear up a few things because it was nowhere near the way we like to play,” he said. “The boys were left with no misunderstandings of where the game was at and what we needed to do to get it back on our terms. In another encouraging sign for the Magpies, Ben Reid and Clinton Young both played close to full games for the first time as they continue to return from respective injuries. Matthew Scharenberg played a fantastic first quarter and was named in the best, while Patrick Karnezis kicked three goals as he combined a role in the midfield with time up forward. Despite having a side stacked with AFL-listed players, Collingwood’s VFL contingent also proved influential. Scott Greenhough, Jack Blair and Ben Moloney were all named in the best, while captain Jack Hellier kicked two goals. The win over the equal-first placed Werribee marks Collingwood’s fifth victory of the season. The entire competition has a week off next week before returning in two weeks’ time. Another challenging opponent will await the Magpies as the Box Hill Hawks travel to Victoria Park on Saturday 27 June. Click on each player’s name to view their profile and headshot for season 2015 as well as coach Dale Tapping's take on their prospects for the year ahead.